Turkish bath and Jacuzzi and is completed by the small pool set in garden. The highlight of Su Passu is certainly the breakfast: fresh and healthy ingredients, as it once was, with ricotta, cheese, honey and homemade cakes and pastries. Recommended to gourmets searching guests for a stay in complete rest and for anyone looking for a quiet place close to the sea and the city centre Alghero. A few kilometers from the city of Alghero, Su Passu is a residence immersed in the green countryside. The structure of the same property, Sa Mandra, is approximately at 5 km away. The wellness center Su Passu is a complex originated from ancient rural houses carefully restored, able to welcome guests in an environment where tradition and modernity coexist in harmony. The original building has been respected and Su Passu is, today, a place where you can rejuvenate your senses through the contact with the nature and the wellness treatments of the center. The rooms at Su Passu, in modern style, are 8 in total and have a floor area of circa 18 sqm each. 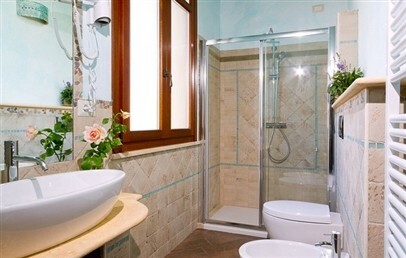 Six rooms have a private bathroom with shower, the other 2 have the hot tub instead. The coast is about 5 km far away from the Agriturismo. By car, you can easily discover Porto Ferro, the protected natural area of Capo Caccia and the several beaches and bays of Alghero. Su Passu SPA is located 5 km away from Sa Mandra. It is an ancient rural house surrounded by greenery and successfully restored while respecting original shapes and materials. The spa consists of Jacuzzis, sauna, turkish bath and aromatic showers. It offers avant-garde treatments and natural products. At Su Passu you can book and rent bicycles to explore the area and enjoy the silence and smells of nature. Guests can practice riding excursions in the nearby at the riding stables of Sa Mandra, located a few miles from Su Passu. Guests of Su Passu can make a delicious and varied breakfast with genuine products that can be enjoyed outside and indoor. A bar service is also available. Su Passu offers plenty of relaxing areas including the patio, the reading room with Internet Point, the bar, the swimming pool available in summer and the garden for nature walks. 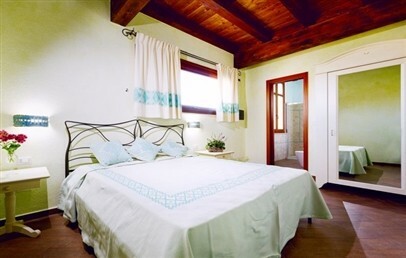 Comfortable double rooms (3rd bed on request) characterized by a mix of Sardinian and modern style and are fully-equipped air conditioning, safe, minibar and en-suite bathroom with shower or whirlpool bathtub.